Jerome of Prague was a Christian martyr. He was sentenced to be burnt to death. He was fastened to the stake. 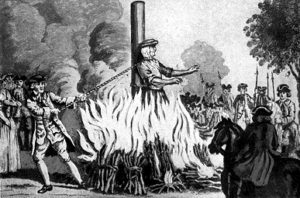 The wood was piled up around him, and the executioner was going behind him to set fire to the pile. As the fire blazed up, he began to sing a hymn, and kept on singing till the flames stopped him.